Today is officially my last post as a Design Team member for the AMAZING Avery Elle. It was a very hard decision for me to make, but necessary. Life has gotten quite busy and I just don't have the time to devote to crafting as much as I'd like. And to spend more time with my family. Jamie has been so wonderful to "work" for. She is a FABULOUS woman and artist. Thank You so much Jamie for taking me on!! I created this using the large Finished Frames die and the super adorable Joy to The World stamp set. 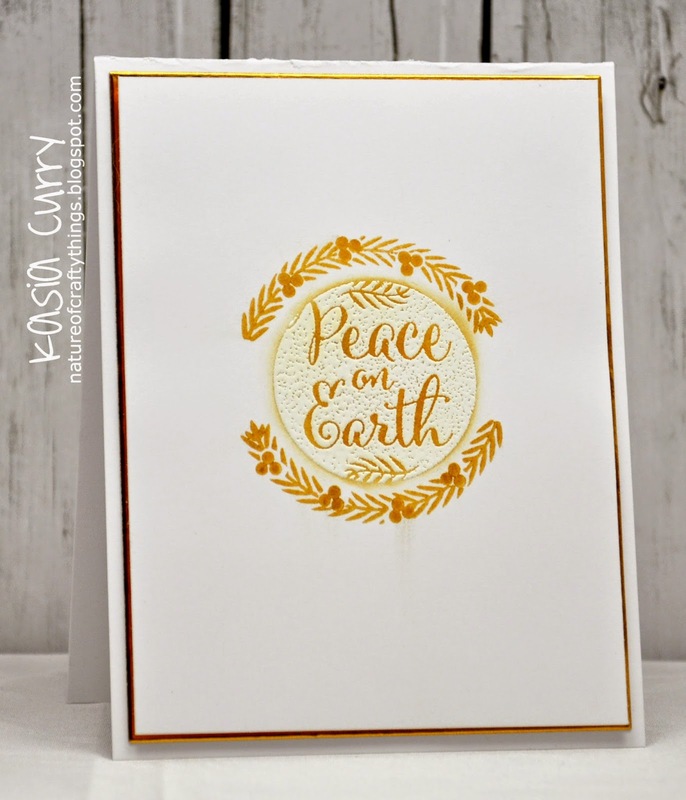 I cut out some metallic gold paper with the die, then stamped the Peace on Earth stamp in Versamark, heat embossed white and then "coloured in" the inside with the Delicata Gold ink pad. To get the smudges around the outside I wiped off the excess gold ink in circles, with a baby wipe, to spread it out past the edges. I really like the effect! Please head on over to the Avery Elle blog for some gorgeous inspiration from more members of the design team. Wow, I LOVE the effect you got on the edges, too!! Really makes it pop...great card, Kasia!